SUSAN SILTON — The stain of________. A stain on________. Part 3 of a trilogy of works that responds to political conditions in the US since 2016. See Parts 1 and 2. In Spring 2018, Silton realized that she had regularly been holding her head facing down since the 2016 United States presidential election—challenged to look up at humanity. In the process of gazing down, she discovered stains on the ground, finding them a resonant metaphor not just for this current political moment, but for all of the “stained” histories we’ve left behind and all of those still to be lived. 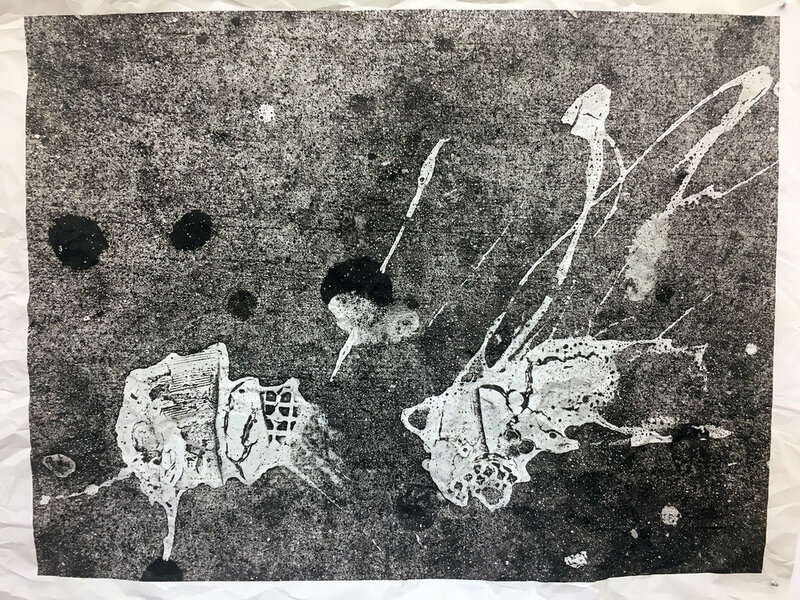 Since then, she has been obsessively documenting stains wherever she walks, creating an archive of messy, splattered abstract blobs left behind by human action. The series presents as large photographic works, printed on a paper designed to resemble newsprint. Once printed, Silton asks either a curator exhibiting the work, or a collector acquiring it, to perform an action “on” the work, by crumpling the print in a kind of performative violence. Silton then carefully opens the print up again and pins to the wall for exhibition, or mounts on board for framing.